I am surrounded by it." If you know me at all or have looked at any of my blog posts, you know I have a thing for rocks. Red, white, pink, yellow, or black rocks - I love them all. I love hiking in/up them, sitting on them to read and paint, or just looking at them on a drive. This is one of the reasons I love the West so much - abundance of rocks. Weird? You might think so, until you see Antelope Canyons outside of Page, Arizona. Then I dare you not to love rocks. Antelope Canyon is a slot canyon on Navajo land east of Page, AZ. It was made by erosion and flash flooding and has only been open to guided tours since 1997. There are two portions - upper and lower antelope canyons. I visited the more popular of the two - Upper Antelope Canyon during my visit but I am desperate to go back and see the lower as well. 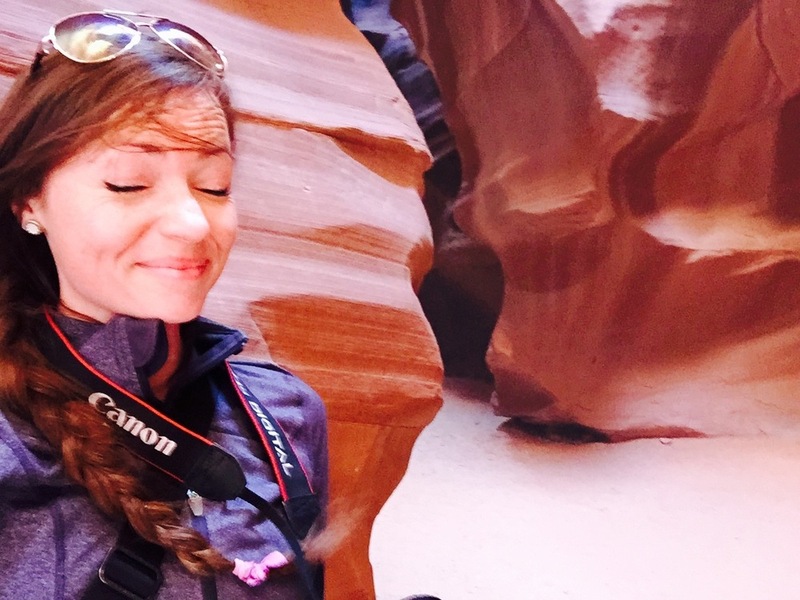 To visit Antelope Canyons you must go on a tour with a Navajo Guide. There is no public access and it is very popular (especially during midday hours due to sunbeams) so reservations are recommended. It is a big tourism business for the Navajo in the area. I visited in April and went with Navajo Tours. There are several tour groups with different prices between $30-$100+ depending on the length of time, the number of people on the tour, and the vehicle that takes you to the canyon. I paid $40 for the tour and the $8 permit fee for the Navajo Tribal Park. The money is well worth it - it's unlike anything I've ever seen. I had to wait a while because I didn't make a reservation - hence why I couldn't visit the lower canyon - but I met a lot of travelers and had some interesting conversations. It's amazing how many international travelers visit the Southwest - they are in awe of the open spaces and park systems that Americans sometimes take for granted. Once the tour began we went on a open topped trailer down the "road" to the entrance of the canyon. It's really just a river bed and can be pretty bumpy - but it feels adventurous. The Navajo guide we had was young and very knowledgeable. Many of the guides will give you photography tips and ours was great for that. Part of the reason for the guided tours is the danger of flash flooding. The canyons were formed due to flash flooding and the risk still exists. In 1997 11 tourists were killed when a flash flood came through the canyon. The rain was a full 15 miles away so now they close whenever there is rain anywhere in the area. It was windy the day I visited - the guide said that he was surprised they didn't close due to the blowing sand - so he gave me his bandana to cover my camera lens. He also told me under his breath with disdain that someone must have played something on a flute in the canyon that will bring the wind. Who knew. The slot canyon itself is really indescribable. It is more beautiful than a picture or words can convey. There were other tour groups there as well but it somehow didn't seem crowded. The guides are really great at getting groups through without rushing. We had time to take pictures on our own after the guided tour and I took full advantage. It's like a different world. A different world that is windy. At the end of the tour our guide took a picture of every group/person which I thought was nice. It was mostly all couples and me (the lone traveler as usual) so I appreciated it. On the ride back the guide offered me the passenger seat which I gladly took and we had a great conversation about his college plans after he found out I was a teacher. Tipping is encouraged on these tours but I would have done it anyways - the guide made it a much more interesting experience. 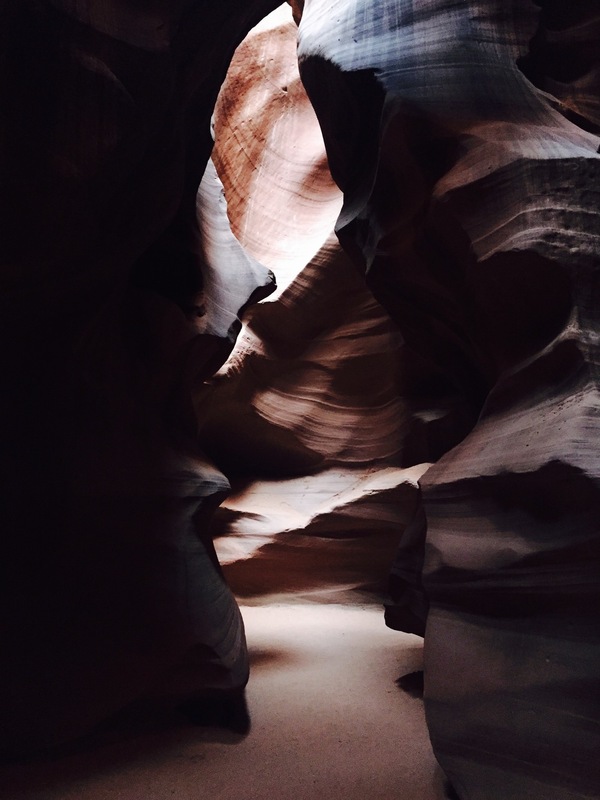 Antelope Canyon is a place you have to plan to go to - it's not near much. But I completely and wholeheartedly recommend that you do. The price may be more than other Parks or Monuments but it is well worth it and a great experience to spend time with native people learning more about their culture. Just remember to bring your own bandana.